On August 9, Samsung will officially announce a new Galaxy Note - fittingly called Galaxy Note 9. When that day comes and Samsung finally unveils the new Note, there may be little to no surprises left to unwrap. That's because we've already seen some alleged Note 9 images, while also hearing a lot about the handset's features. On top of that, today we can take a look at what is, reportedly, an "official" Samsung Galaxy Note 9 render. Revealed by Android Headlines, this new Galaxy Note 9 render only shows the smartphone's front side. 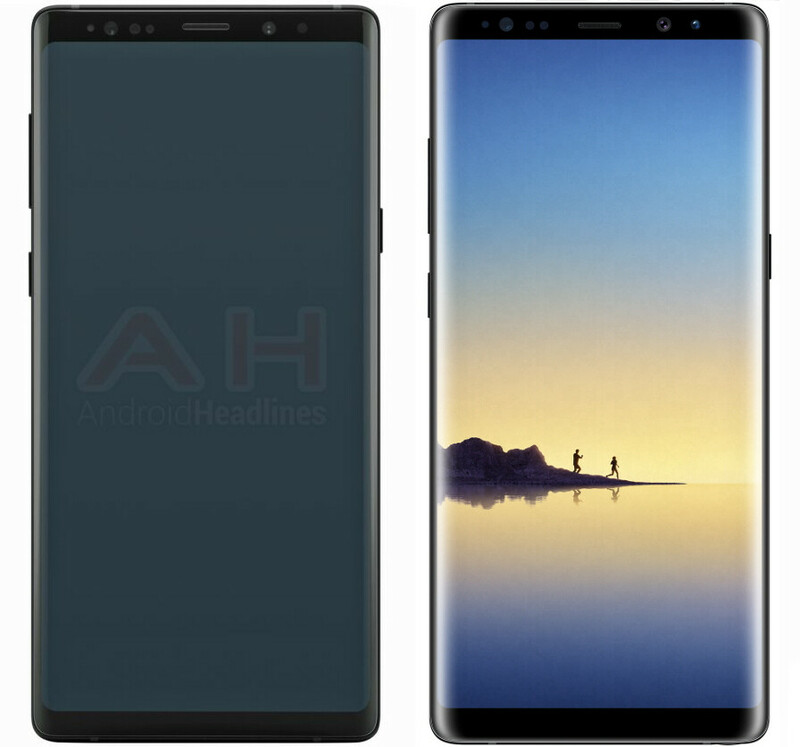 As previously suggested, the Note 9 will look a lot like last year's Galaxy Note 8 (pictured above) and should sport a similar dual-curve 6.3-inch Super AMOLED display. When viewed from the front, the two devices are nearly identical, and even their side buttons are placed in the very same positions. According to a recent report, the Galaxy Note 9 measures 161.9 x 76.3 x 8.8 mm, so it's almost unnoticeably shorter and wider than the Note 8, which measures 162.5 x 74.8 x 8.6 mm. Side by side, the two phones could look as below, more or less (the Note 9 from Android Headlines is on the left, while an official Note 8 image is on the right). The Galaxy Note 9 is expected to bring a redesigned rear camera, which will make it stand out next to the Note 8, but this isn't pictured here. 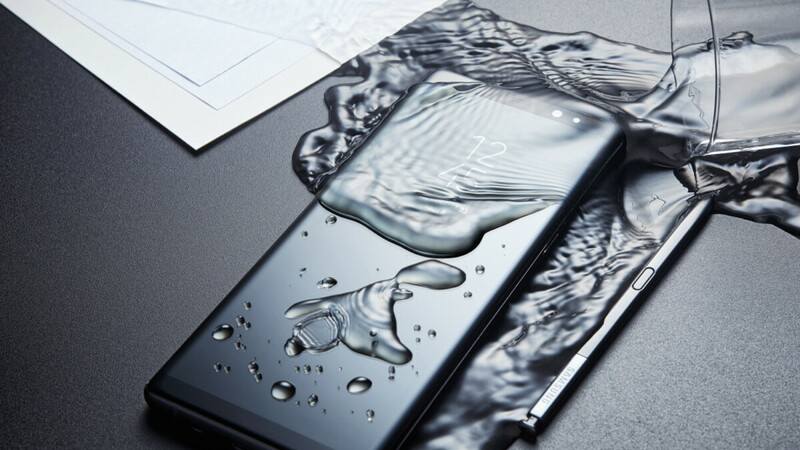 Design aside, the new Samsung Galaxy Note should offer various improved features, including a Snapdragon 845 processor, a larger battery, and a thoroughly upgraded S Pen experience. You can find out more about the upcoming phone by reading our Samsung Galaxy Note 9 rumor review. Actually, instead of "Camera. Reimagined", Samsung should advertise the whole current flagship lineup as "Boringness. Redefined" or "Lazyness. Redefined". I'll label this comment as, "Idiocracy, exquisitely defined." We could definitely apply the same slogan to your comments. It's the same ugly design from Note 5, it's almost the same phone as Note 8. Why would anybody buy such an ugly huge phone in 2018 with no any innovative new features at all...?? Says the troll that defends Apple's choice to keep the same design for 4 straight years and have no issue with 8 looking like the 6. Same reason people by the same boring design iPhone year after year with features removed sno definitely no innovation there. Obviously you've owner neither. I've owned both. The first was excellent. The next was even better. You're obviously trying to troll. But you look really pathetic. I am wondering the same thing. This is basically an S9 with an S pen. There is zero innovation. Heck in the past the Note series at least had a higher clocked CPU/GPU. And the finger print scanner is still on the back. I will never get a phone with a fps on the back, it just seems illogical to me. I am waiting for the S10. And I can only advice you all to do the same. 7nm CPU and inscreen FPS! Your entire comment is senseless. The Notes' CPU/GPUis always higher then the S, it always has more features than the S (making it more than an S with an S Pen), the Note 9 was intended to have the FPS on the back & lastly, Note users & S users are a completely different customer base. I can only advise (not advice) you to know what you're talking about before posting comments. Your talking about the iPhone that way, I am shocked. Yet probably as good as phones are in production today. Not a bad failure IMO. Considering their main competition (Apple) has generated billions in revenue from phones without changing any of the hardware for almost 10 years, might wanna call it "Common Sense. Reimagined." Samsung would look like complete idiots if they take the burden of constantly reinventing themselves to keep up with a company that has a reputation for charging more money and TAKING AWAY features every year. Ready to trade in the old S7 edge (forced choice from Note 7 debacle) and finally have a Note again! Did that last year, man. Couldn't wait to get out of that S7E. You should wait til next year when they do actual changes to their devices instead of just under the hood stuff. Buy the new upcoming iPhone XI Plus and thank me later. He would probably want to knock the poo out of you for it. Wrong. That's the cutting edge of mobile UI. Well, at least until Apple does something different, hires their media marketing machine to prai$e it incessantly, then the army of fanboys proclaim their new UI as the greatest innovation of the 21st century then claim that Android UI and it's flexibility and widgets are all a sad attempt at copying Apple's innovation. Get it? Debacle is an understatement. The Note 7 was the worst product and product launch in consumer tech history. Less curvier at the edges than Note 8 resulting in fuller images so that's nice. One of the reasons I hate curve screens are images always looking narrower than it is. Couldn't have said it better myself. That alone tempts me to upgrade from my note 8. Samsung fanboys are HUGE HYPOCRITES. When Apple made phones with boring designs and doesn't change their "bezels" much, they go NUTZ in the comment section, like a volcano erupting or something. They make fun of Apple users and even confront them with foul language. BUT when Samsung is lagging behind they try to praise is no matter what, In fact they try sooooo hard to justify Samsung's lack of innovation. Actually this phenomenon is so funny and sad at the same time. Poor Samsung fanboys are in a strange place now. Wow. You're stupid as hell. The iPhone did it 4years in a row. Samsung only did it last year & this year. But only people with common sense would know that. I own the Note8 and love it. But, some issues concerning this ... #1 I agree now with what you're saying. It's nothing major, but technically you are correct about images #2 In certain rare cases I've ran into problems trying to use the S-pen while at the edge of the screen #3 Curve makes glass screen even more fragile. Mine has literally 3 splinters on the curved edges now. Two from marginal drops and on from a pretty nasty one. Regardless, this is ridiculous nearly a decade and a half since the advent of the smartphone. This is a MOBILE device. Make the freakin' display non breakable in what will be handled in hand dozens of times per day! Glass is NOT a quality material over a display in 2018. It's an ancient material. I won't even start on the back glass. And no a case is a ridiculous compromise for a $900 device. ... that's all. The 9 series is mostly about software, the 10 series brings a newer look...not too new though.